My candidate for 2012 has been the same as my candidate was for 2008: Rudy Giuliani. Now, I’m starting to really like a fresh face: New Jersey governor Chris Christie. 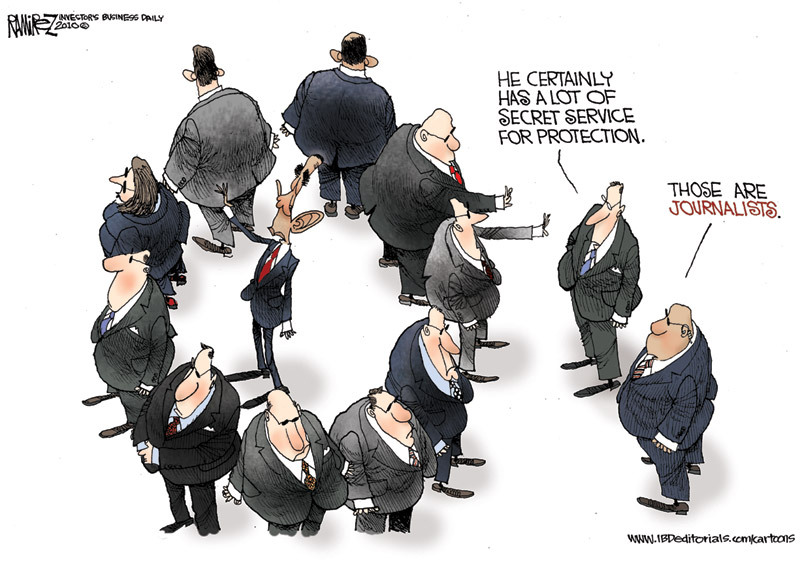 …The problem for the Democrats, however, is not a new Contract With America, or the Tea Party. Their problem is Chris Christie. Mr. Christie was direct, unadorned: You can’t tax your way out of a spending problem, you’ve got to stop spending. Governors have budgets for which they’re held accountable, so he had to move. But Mr. Christie’s way is also closer than most national Republicans have come—or Democrats will come—to satisfying the public desire that someone step forward, define the problem, apply common sense, devise a way through, do what’s needed. He’s going to break through in a big way. The answer to our political problems lies in clarity, competence and courage, not a visit to crazy town. And he knows how to put out his hand. “As much as I love teachers.” That’s good. And I don’t care that he’s overweight. Enough with the pretty boys and the race and gender candidates so appealing to self-congratulating, pious liberals. …The U.S. has never subscribed to the idea of a nation run by philosopher-kings. Even the Founders disassembled. The Obama White House, as with its new director of Medicare and Medicaid, Donald Berwick, is explicit in its belief that the smartest can design a nationwide health-care system for the rest—if the people will give them enough money to do so. And they could have designed a successful stimulus program—if the people had given them more than the piddling $862 billion they got. …All the accusations of “racism” at anti-Obama rallies so far have turned out to be completely false. The most notorious was the allegation that one black congressman was spat on and another called the N-word 15 times at an anti-ObamaCare rally on Capitol Hill last March. The media never retracted it, even after the N-word allegation was proved false with a still-uncollected $100,000 reward for two seconds of video proof taken from a protest crawling with video cameras and reporters hungry for an act of racism. Meanwhile, we do have video proof of the New Black Panthers standing outside a polling station in Philadelphia in 2008 with billy clubs threatening white voters who tried to vote. And there is video footage of Sarah Palin, Karl Rove, Condoleezza Rice as well as a slew of conservative college speakers being assaulted by crazed liberals. Over the past couple of election cycles, Bush and McCain election headquarters around the country have been repeatedly vandalized, ransacked, burglarized and shot at (by staunch gun-control advocates, no doubt); Bush and McCain campaign signs have been torched; and Republican campaign volunteers have been physically attacked. It was a good day when George Bush was merely burned in effigy, compared to Hitler or, most innocuously, compared to a monkey. In the fall of 2008, Obama supporters Mace’d elderly volunteers in a McCain campaign office in Galax, Va. In separate attacks, a half-dozen liberals threw Molotov cocktails at McCain signs on families’ front yards in and around Portland, Ore. One Obama supporter broke a McCain sign being held by a small middle-aged woman in midtown Manhattan before hitting her in the face with the stick. These are just a few acts of violence from the left too numerous to catalog. There were arrests in all these cases. There was, however, absolutely no national coverage of the attacks by Obama supporters. …I wrote about that JournoList scandal on Saturday, and would like to share the gist of mail that came back to me after that article was linked through the States. I expected to hear from a lot of good, right-wing, Tea Party types, congratulating me for even mentioning the issue in the “mainstream media,” but instead about half the notes from these people were unfavourable. They thought my dismissal of the affair — I wrote that while it certainly looked like a conspiracy to twist the news, in fact liberal journalists would have twisted it the same way even without methodically consulting each other — was inadequate and cowardly. Nor did they accept my view that the “crime” was not journalistic bias, but instead the journalists’ condescending pose of “objectivity” when delivering news and analysis that is steeply slanted. The purely political dimension of this was spelt out, repeatedly. President Barack Obama won an election in which he posed as a moderate, and a “uniter.” But the same journalists who knew perfectly well that he was a radical liberal, just like them, with a personal background of association with characters far to the Left, and an agenda bearing little relation to his campaign promises — did everything in their power to conceal this. Instead they acted like attack dogs on his genuinely moderate opponents. I don’t agree with this view, incidentally. I do not excuse the American people for electing this man. Nevertheless, this sense of “having been conned” is alive and consequential. Indeed, were I a liberal politician, even in Canada, I’d be listening up. The pendulum of public opinion is swinging dramatically away from complacency in what I call the Nanny State, because the Left has made the egregious, if very human error, of pushing their luck too far. Polls, at least in the U.S., show “trust in the media” to be at the subterranean lows of “trust in politicians.” To my mind, it is no coincidence that daily newspapers and other “mainstream” vehicles have endured shrinking audiences and attendant financial woes. The losses are compounded, as each institution comes to terms with the technology of the Web, but that is a side issue. The nimbler players are already mastering that adaptation. The deeper issue is “content.” People will not read or view what they consider to be a waste of their time, and in particular, will not seek news from sources they believe to be tainted. The exclamation mark is affixed, when the mainstream media sweep the JournoList controversy under the rug — at a moment when their audience is free to read all these appalling e-mails on the Internet. As I insist, the most damaging thing for a purveyor of news is not bias, per se, but an apparent lack of candour. People want to know “what really happened,” and if it is obvious that Agent A will not tell them, they will turn to Agent B. To my mind, that is exactly why my profession is in big trouble. …One of the ideas that has proved to be almost impervious to evidence is the idea that wise and far-sighted people need to take control and plan economic and social policies so that there will be a rational and just order, rather than chaos resulting from things being allowed to take their own course. It sounds so logical and plausible that demanding hard evidence would seem almost like nit-picking. The idea that the wise and knowledgeable few need to take control of the less wise and less knowledgeable many has taken milder forms– and repeatedly with bad results as well. As they replaced central planning with more reliance on markets, their countries’ economic growth rate almost invariably increased, often dramatically. In the largest and most recent examples– China and India– people by the millions have risen above these countries’ official poverty rates, after they freed their economies from many of their suffocating government controls. China, where famines have repeatedly ravaged the country, now has a problem of obesity– not a good thing in itself, but a big improvement over famines. …independent white voters, many of whom voted for Obama, sense that something like [former White House “czar”] Van Jones, or [Eric Holder’s nation of]“cowards,” [speech] or the Prof. Gates matter, or the recent Sherrod non-story, or “wise Latina” will turn up about every three weeks from now on out. They suspect that it will, not just because the staffers at Fox will find it or even hype it, but because there will always with this administration be something to find. Just as the left was always able to dig up some over-zealous Christian evangelical in the Bush administration (because there were apparently a lot of them), so too the right will find a lot of racial promoters because, quite simply, there are a lot of them in this administration. …Do journalists collude with one another on how to “spin” stories? On developing “talking points,” just like politicians? On which red herrings can be purposely thrown in, to mislead and distract readers from the truth? On how to hide hard but inconvenient facts? On how to help their friends, hurt their enemies, and generally, stage-manage the presentation of the news to advance a common political agenda? I would say, no, they don’t have to. These are all things they (er, “we”) can do instinctively, without any need of formal co-ordination. All that is required is a profession whose practitioners form a self-recognizing class; who share a settled (and rather conformist) view of the world; and who spend most of their lives in each other’s company, hardly ever meeting, let alone mixing socially with, people of other classes with other points of view. The controversy is much like that surrounding the environmental movement, since the e-mail archive of the Climate Research Unit in England was hacked, and electronic swathes spewed gratuitously around the Internet. Those who never suspected the world’s leading “global warming” researchers of honesty or candour could hardly have been shocked by what they read. But those who believed them to be “detached” and “disinterested” scientists were in for a few surprises. The juicy bits from the JournoList archive, exhumed and disseminated through the (conservative) Daily Caller website, show leading mainstream U.S. journalists discussing things like how to trash and smear Sarah Palin most effectively, in the moments after John McCain selected her as his running mate. Or, how to distract America from the scandal of Barack Obama’s long and intimate affiliation with the Rev. Jeremiah Wright, when that story hit the fan. It is interesting that the major themes of mainstream journalistic reporting exactly repeated those thrashed out on JournoList, beforehand — where it was taken for granted that the journalists’ purpose was to get Obama elected, by performing services as an informal “detachment” of the Obama campaign. It looks for all the world like a carefully-organized conspiracy. And yet it isn’t. As Joe Klein, of Time magazine — prominent both as journalist and on JournoList — hath protested, he didn’t need any strategy sessions in e-mail to decide how to attack Palin; he could “easily” have selected all the angles, by himself. And I do not doubt for a moment that he is telling the truth. …From Morocco to Afghanistan, from the Caspian Sea to Aden, the 5.25 million square miles of territory belonging to members of the Arab League is home to over 330 million people, whereas Israel covers only eight thousand square miles, and is home to seven million citizens, one-fifth of whom are Arabs. The Jews of the Holy Land are thus surrounded by hostile states 650 times their size in territory and sixty times their population, yet their last, best hope of ending two millennia of international persecution – the State of Israel – has somehow survived. When during the Second World War, the island of Malta came through three terrible years of bombardment and destruction, it was rightly awarded the George Medal for bravery: today Israel should be awarded a similar decoration for defending democracy, tolerance and Western values against a murderous onslaught that has lasted twenty times as long. The Jewish contribution to finance, science, the arts, academia, commerce and industry, literature, philanthropy and politics has been astonishing relative to their tiny numbers. Although they make up less than half of one per-cent of the world’s population, between 1901 and 1950 Jews won 14 percent of all the Nobel Prizes awarded for Literature and Science, and between 1951 and 2000 Jews won 32 percent of the Nobel Prizes for Medicine, 32 percent for Physics, 39 percent for Economics and 29 percent for Science. This, despite so many of their greatest intellects dying in the gas chambers. Civilization owes Judaism a debt it can never repay, and support for the right of a Jewish homeland to exist is the bare minimum we can provide. Yet we tend to treat Israel like a leper on the international scene, merely for defending herself, and threatening her with academic boycotts if she builds a separation wall that has so far reduced suicide bombings by 95 percent over three years. It is a disgrace that no senior member of the Royal Family has ever undertaken an official visit to Israel, as though the country is still in quarantine after more than six decades. Very often in Britain, especially when faced with the overwhelmingly anti-Israeli bias that is endemic in our liberal media and the BBC, we fail to ask ourselves what we would have done placed in their position? The population of the United Kingdom of 63 million is nine times that of Israel. In July 2006, to take one example at random, Hizbollah crossed the border of Lebanon into Israel and killed eight patrolmen and kidnapped two others, and that summer fired four thousand Katyusha rockets into Israel which killed a further forty-three civilians. Occasionally my contemporaries in the “mainstream media” do superb work, and let me mention the reporting in the Washington Post on America’s intelligence establishment. The gist of it is that in the 106 months since the terror strikes of 9/11, more than 3,000 government and private contractor organizations have sprung up or been re-sprung from previously existing, to address questions of homeland security. They now operate from 10,000 locations across the U.S., and the better part of a million people now have top-secret security clearances to work in them. In Washington alone, over this time, 33 new building complexes have been or are being erected to further this task, with aggregate floor area three times that of the Pentagon. More than 50,000 intelligence reports are generated each year. Note that this vast machinery utterly failed to stop any of the last few known terror strikes or attempts in the U.S. — the Christmas airline bomber in Detroit was stopped by an alert passenger, an Islamist nutjob uttering public threats slipped through all internal checks within the defence department to open fire in the military base at Ford Hood, and so on. A further occupational blindspot is that which the notoriously rightwing and acute Mark Steyn identified, early and often, in writing about the response to Islamist terror. “Political correctness” is taken for granted, even when it costs lives. You mustn’t “profile” people (as all traditional police work required), no matter how inefficient or counter-productive it may be to treat every midwestern grandma as a potential suicide bomber. Indeed, with a much smaller security establishment (even proportionally), and much less invasive techniques, the Israelis have a far better record for stopping terrorists dead in their tracks. And this, only because they shamelessly profile their lethal enemies. When “politically correct” attitudes prevail, we get not only vast bureaucracy, but also, the real bad guys slipping through highly visible cracks. Nor is this situation improved when budget cuts follow and the cracks widen. Moreover, at the very top, intelligence findings, such as they are, take the back seat to political calculation. Every major U.S. intelligence finding over the last decade, including “weapons of mass destruction in Iraq,” has been dead wrong. In turn, the celebrated, very public 2007 finding that the Iranians had given up their nuclear weapons program, was delivered for no other plausible purpose than to cut the legs out from under President Bush before he started another war. The next, corrective one, showing Iran indeed still working on it, will be designed to help Obama make a case for tougher sanctions. The vaunted 9/11 Commission labored long and expensively and still refused to conclude that political correctness prevented the discovery of the really quite inept 9/11 plotters . The FBI bigwigs (not the field agents) refused to investigate alerts from flight schools that Arab men were undergoing training to fly airliners and were curiously uninterested in learning how to takeoff and land. Hours of sensitivity training and the clear understanding that an accusation of racism is a career killer surely led FBI bureaucrats to avoid stirring up a hornets’ nest. Someone once defined “affirmative action” as the process by which the power elite discriminate against one group of underprivileged people in order to give an advantage to a second group of underprivileged people. …Last year, two Princeton sociologists, Thomas Espenshade and Alexandria Walton Radford, published a book-length study of admissions and affirmative action at eight highly selective colleges and universities. Unsurprisingly, they found that the admissions process seemed to favor black and Hispanic applicants, while whites and Asians needed higher grades and SAT scores to get in. But what was striking, as Russell K. Nieli pointed out last week on the conservative Web site Minding the Campus, was which whites were most disadvantaged by the process: the downscale, the rural and the working-class. Now, let’s be clear about a couple of things right from the beginning: First, all other things being equal a liberal-democratic society should have no problem accommodating a multiplicity of different cultures, and the traditions and customs that go with them; Second, in a free society, again with that proviso — all other things being equal — the way people dress in particular should be entirely their affair. As general propositions about Western society, few would disagree. But with the French parliament’s decision to ban the burka this week in mind, it is a sign of the shallowness of much of Europe’s liberal establishment that no greater level of sophistication about such issues, and the profound implications they entail, is currently possible. The burka ban has been variously described across the continent by bien pensant opinion as “racism” “bigotry” and “Islamophobia”. So much is to be expected. But in some cases, they have truly outdone themselves. “Users of the metro or underground learn instinctively to avoid looking each other in the eye. It is regarded as an intrusion. And yet no state legislature would think about passing a law that bans the wearing of sunglasses indoors on the grounds that it poses a threat to national security”. I promise readers that I did not just make that quotation up. A form of dress so extreme in its oppression of women that it forces them to hide their faces from society and that thus represents a form of subjugation unheard of in Europe since the witch burning days of the Inquisition is being compared to keeping yourself to yourself on the underground railway system, or the wearing of sunglasses. He’s Just Like Me, But Better! An irresistible force is meeting an immovable object on the field of perception, and causing an odd sort of storm. The irresistible force is the growing idea that Obama has failed as a leader on a number of items: “Engagement” has failed; our allies are angry; the oil keeps gushing, his ideas are job killers; the recession goes on. The immovable object is the conviction on the part of some who are also his critics that he is the smartest man who has ever held office, and is therefore too brilliant to fail. Citing his “shimmering intellect,” Richard Cohen is at a loss to explain why he hasn’t done anything with it. “Obama, for all his brilliance, has no real, felt understanding of management structures,” says Tina Brown, describing the failure to handle the oil disaster, without explaining what, beyond talking, Obama has been brilliant at. He can talk up a storm (though of late this has faltered), but so far his shimmering intellect has led him to think that aggressors can be tamed by making concessions; that he should expand the welfare state just as it is proving unworkable (and very unpopular with the American people); and into replicating to an exact degree every mistake made by George W. Bush in handling Katrina in 2005. When and how then does this president’s intellect shimmer? At meetings. He does seem a genius at chairing a forum, as at the “nuclear summit” in April, where the Washington Post claimed that he shone as a teacher, “calling on leaders to speak, embellish, oppose, and offer alternatives,” coaxing consensus and forging agreements among 45 countries at hand. The problem was that the value of these things was limited, as the attending countries weren’t menacing anyone, while Iran and Korea, who were not in attendance, went on happily building their bombs. He isn’t a sphinx, he’s a seminar leader who’s out of his element. And more and more out of his depth. …And honestly, he’s not that great at running meetings. His Afghanistan-war seminars dragged on. His health-care summit bombed when Rep. Paul Ryan and others stymied him with facts and figures. 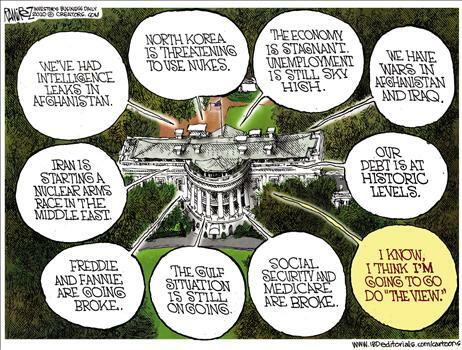 Now that Obama’s policies and political standing are faltering, the media mavens are puzzled, as Emery notes. How can it be that he’s failing when he’s so smart? It never dawns on them that they confused slickness with smarts and urbanity with insight. Whether it is Obama or Elena Kagan, it’s rather easy to impress the chattering class — an Ivy League degree, poise before the cameras, verbal acuity, and disdain for conservative ideas usually do it. It matters not what these figures have produced (legal opinions, legislation, etc.) but with whom they circulate and where they’ve studied. To a great degree, social elitism has replaced meritocracy as the left’s yardstick. Unfortunately for Obama, he will be judged by what he does, not how he looks doing it. And frankly, his polish and charisma (conservatives never saw the latter, but others did) are crumbling under the pressure to finally produce something (jobs, a responsible budget, a plan for disarming Iran). There is a reason, as Emery points out, that no president has been “a blogger, a pundit, an editor of the New Yorker, or a writer for Vanity Fair.” It turns out that the rationale for the media’s lovefest — he’s just like me, but better! — was not relevant to the presidency. …Michael Mukasey was attorney general from November 2007 to January 2009. He remembers visiting Guantanamo Bay in February 2008. He looked at many of the high-value detainees on video monitors. But he did not see Khalid Sheikh Mohammed; Mohammed wasn’t in his cell. He was off having a Red Cross visit. Mukasey did see the exercise room, adjacent to Mohammed’s cell. And he noticed something interesting: Mohammed had the same elliptical machine that he, the attorney general, had back home in his Washington apartment building. Only there was this difference: Mukasey had to share his, with other residents; there was a mad scramble in the morning to get to it. Mohammed had his machine all to himself. Bear in mind that he was the “mastermind” of the 9/11 attacks, which killed almost 3,000 people. That he was the beheader of Daniel Pearl. And so on. I wonder how much more tenderly America’s critics expect us to treat such people. “Abdominal massages,” of the type Al Gore apparently requests?